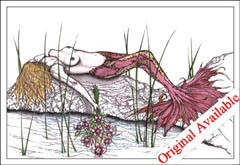 Stories of Mermaids and Sea Maidens have been recorded throughout history. Sailors of old tell of the Maiden's Hypnotic call and still today it's rumored to be responsible for the countless shipwrecks on and around the Florida Keys famous coral reefs. 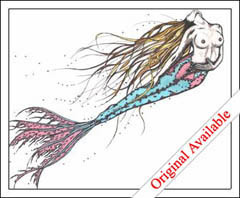 "Mermaid": A marine creature with the head and upper body of a beautiful young maiden and with the lower body of a fish. 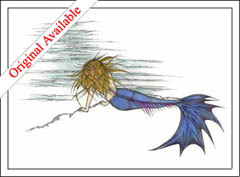 She can be found in seas and lakes, or lying on a rock and combing her hair with one hand while holding a mirror in the other. Mermaids sometimes foretell the future and are often accompanied by seals. According to myth, they lure sailors by singing and with lovely music. They live in a kingdom on the bottom of the sea, and it is here they take their prisoners to. 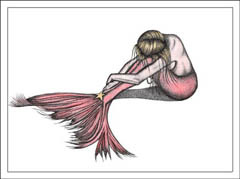 From this story, the fear amongst the sailor grew and they thought that seeing a mermaid would cause bad luck: it could predict death by drowning. 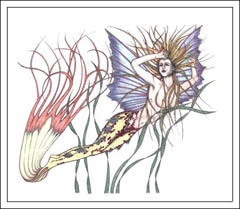 The belief in mermaids is not limited to a few countries, but there are tales from all over the world (in India, for instance, there are the Apsara, beautiful water nymphs). However, most of those tales were told by sailors who "saw" them on their long journeys. 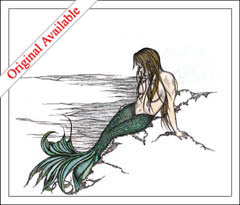 The idea of mermaids and mermen, the male equivalent, could be based on creatures from Greek and Babylonian mythology: Sirens and Tritons of the Greeks, and the fish gods, who were half human and half fish, from the Babylonians. 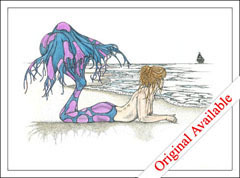 "Amphitrite" - Mermaid "Amphitrite" (am-fa-tri-tee) resting peacefully on the seashore. The queen of the sea, variously given as the daughter of Oceanus and Tethys or of Nereus and Doris. When the sea god Poseidon wanted her as his bride, she declined the honor and hid from him in the Atlantic Ocean. A dolphin not only located her, but also brought her back to him, and he married her. The dolphin was awarded a place in heaven. Their son is the fish-man Triton. Amphitrite was portrayed on Greek amphoras together with her consort, riding in a chariot pulled by sea creatures, or sitting on a sea creature, surrounded by Tritons. She is decorated with the attributes of a queen, her hair covered with a net, and sometimes with the pincers of a lobster attached to her temples. The Romans referred to her as Salacia. The name means something like "The third one who encircles (the sea)"
"Astraea" - As the wind blows through her hair she casts her gaze far from shore. Astraea ("the star-maiden") is the daughter of Zeus and Themis. She was, as was her mother, a goddess of justice. During the Golden Age, when the gods dwelled among mankind, she lived on the earth. When evil and wickedness increased its grip on humanity, the gods abandoned the habitations of mankind. Astraea was the last to leave and took up her abode among the stars where she was transformed into the constellation Virgo. "Calypso" - Beset with wings and fated to a life beneath the sea. Calypso was a nymph, the daughter of the Titan Atlas. She lived on the island of Ogygia. After the last of Odysseus' men had perished at sea, Odysseus himself was washed ashore on Ogygia, where Calypso became enamored of him, taking him as her lover and promising him immortality if he would stay with her. Odysseus refused her offer, wishing to return home to Ithaca and to his wife, Penelope. But Calypso refused to let him leave, and held him prisoner for seven years. Finally Athena complained of Odysseus' plight to Zeus, and Zeus sent Hermes to Ogygia to order Calypso to set Odysseus free. Calypso complied reluctantly, allowing Odysseus to construct a small boat and set sail from the island. Calypso remained, swiming the waters, watching for his return. "Hope" - The Good Spirit rests. Also known as "ELPIS" was the female DAIMON (Spirit) of hope. She, along with the other Daimones, were locked in a jar by Zeus, and entrusted to the care of the first woman Pandora. When she opened it in her curiousity, all of the spirits escaped from the jar, except Elpis (Hope), who remained behind to comfort mankind. "Lily" - Known as the Goddess of Dreams Lily sleeps with her bouquet in hand atop a pebbly perch. In Greek poetry, the lily stood for tenderness. It was also referred to as the voice of cicadas or of the muses. There is a Greek myth that tells us how the lily was born from the milk of the goddess Hera. The lily still symbolises pure, virginal love in the Christian world. "Lorelei" - Lying on the shoreline Lorelei waits as her Sailors draw near. According to German legend, there was once a beautiful young maiden, named Lorelei, who threw herself headlong into the river in despair over a faithless lover. Upon her death she was transformed into a siren and could from that time on be heard singing on a rock along the Rhine River, near St. Goar. Her hypnotic music lured sailors to their death. The legend is based on an echoing rock with that name near Sankt Goarshausen, Germany. "Thalia" - The Muse. Her wish is to Inspire. Gliding through the deep she is the image of boundless Freedom. The Muses were worshiped widely in the ancient Greek world. The Muses were said to be the inspiration of anything having to do with the arts. Nine goddesses were seated on Mt. Olympus near the throne of Zeus. Each of the nine daughters of Zeus and Mnemosyre (Goddess of Memory) were responsible for one of the many aspects of art.